We are located at the Rod 'N' Reel Dock adjacent to the Chesapeake Beach Hotel & Spa (4165 Mears Ave., Chesapeake Beach, MD 20732). For MapQuest directions, click here. From the Washington Capital Beltway (I95/495): Take Route 4 South (Exit 11A). . .
From the Baltimore Beltway (I695): Take Route 3/301 South to Route 4 South. . .
From Frederick or Western MD: Take Route 270 to the Capital Beltway heading towards Andrews Air Force Base and then take Route 4 South (Exit 11A). 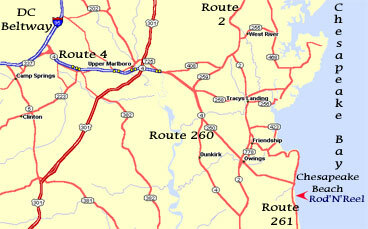 . .
From Route 4 take Route 260 East to Chesapeake Beach, then make a right on Route 261. Make a left at the light onto Mears Avenue. The Plumb Crazy is located by the Tackle Shop and Smokey Joe's. If you get lost heading to the boat, please give Captain Eddie a call at 301-233-0377.